The ANC’s National Executive Committee is due to meet on June 18 to discuss the problems besetting its provincial structures. At least three of its provinces are in political chaos, and three others are in leadership limbo. It has to sort out this mess before it can move on to finalise its lists of candidates to represent the party in the general elections next year – a process that can turn bloody and, according to the party’s own research, can affect its electoral fortunes. In the run up to elections – local and general – political parties are meant to submit lists of candidates to the Independent Electoral Commission. This process usually happens with little to no fanfare in most political parties in South Africa. For the ANC, which for 24 years got the lion’s share of the vote, this process is often controversial and sometimes leads to violence. This is because it is seen as an employment agency of sorts and a means to control the public purse; whoever makes it to the top of the lists is guaranteed a deployment in the state. After the significant losses the ANC suffered in metros in the 2016 local government elections, it embarked on a mission to find the root cause of its electoral misfortune. In that process, it found that when its branches and structures are in disarray, people punish the party by staying away from the polls. It also found that the unhappiness over the lists’ process of how public representatives from the ANC are chosen leads to widespread dissatisfaction within the party and as a result, a direct impact on the electoral performance. At the time, violence besmirched the process where people were beaten up for supporting one candidate over another. Some regional leaders faced death threats from people who did not feature on the party’s lists of candidates and the faction in charge of the ANC invariably became the people who led in the state. Since the devastating 2016 local government elections, the political dynamic may have changed positively on the national front, but the party is on its knees in almost all of its provincial structures. The ANC in the Free State’s newly-elected leadership has been contested, the ANC in North West is led by a man facing allegations of rampant corruption and the situation in the party in KwaZulu-Natal is so dire, people are killing each other over politics. The ANC in the Eastern Cape is facing legal threat, while the ANC in Limpopo, Mpumalanga and Gauteng is facing a tough contestation towards upcoming conferences. The current factionalism and political divisions in its provincial and lower structures are once again threatening ANC’s electoral performance. Party strongmen loyal to former president Jacob Zuma are clinging on to power or are ensuring their proxies are parachuted into office. They are risking everything to do so even when it seems politically illogical. An old hand at party politics and a current NEC member explained that these strongmen know that for the next five years, their political ambitions will be curtailed because of the change in the guard but they believe they can still call the shots on who will have the keys to the public safe for the next five years on a provincial level – especially in provinces with large rural areas where the ANC is by far the majority party. Take North West strongman Supra Mahumapelo for example: he knew the new political mood would halt his tenure as premier. But he and his allies are refusing to give up the top seats in the party which in effect makes them in charge of who will lead the state. It is the same in the Free State, where the provincial conference in May 2018 was contested. Former strongman, Ace Magashule is accused of having a proxy – Sam Mashinini – installed as chairperson. In the ANC in KwaZulu-Natal, the fight between two sides has evolved into a bloody political tug-of-war. Their provincial conference was called off because of a court interdict. In short, whoever wins the political fights and contestation still wins the keys to the state coffers. It explains why it has become a matter of life and death in so many instances. According to the ANC’s assessment in the last NEC meeting, the state of its provinces will impact on its ability to convince the majority of the population to support the ANC in the 2019 elections. Which is why the party is meeting in Irene to iron out the mess so that it can roll out its election campaign. The most pressing issue it has to decide on is who will be the North West premier up until the 2019 elections. There were reports of the ANC reneging on an agreement with alliance partners of who should feature on the list of three names submitted to the NEC to consider for the position of premier. After the last three names were thrown out by the NEC, the Mahumapelo-led provincial ANC is now gearing up to bring the names of former premier and now minister Edna Molewa, ANC acting provincial secretary Susan Dantjie and current South African ambassador and permanent representative to the UN and former Foreign Affairs director-general Jerry Matjila. The SACP and Cosatu are upset because their efforts to have former MEC Zakes Tolo appointed caretaker premier have been ignored. On the surface, this debate seems inconsequential. But if you break down the names you would find that the list was carefully orchestrated to lead to an inevitable outcome; a Mahumapelo ally to be placed in charge. Molewa served as premier there from 2004 to 2009 and while it may seem like a good fit, she has been accused of being partial to the divisions in the province. Matjila on paper seems the ideal candidate – a renowned diplomat who led one of the most important government departments. However, very quickly you will find that he is facing corruption allegations and may soon be recalled as ambassador for it. Which, cleverly, leaves Dantjie as the last remaining candidate: she has repeatedly shown her loyalty to Mahumapelo and as the SACP put it, would be no different to him. The ANC in KwaZulu-Natal would also be on the agenda of the NEC meeting after its provincial conference fell apart due to a court interdict. An effort to have a consultative conference instead failed after the meeting resulted in chaos. Now, there has been a push to delay the conference until after the elections and that a interim team made up of both sides of the factional divide lead the province to the 2019 elections. Sihle Zikalala, the former chairman, and his supporters are dead set against this and are likely to argue in the ANC that the provincial conference should take place by July. 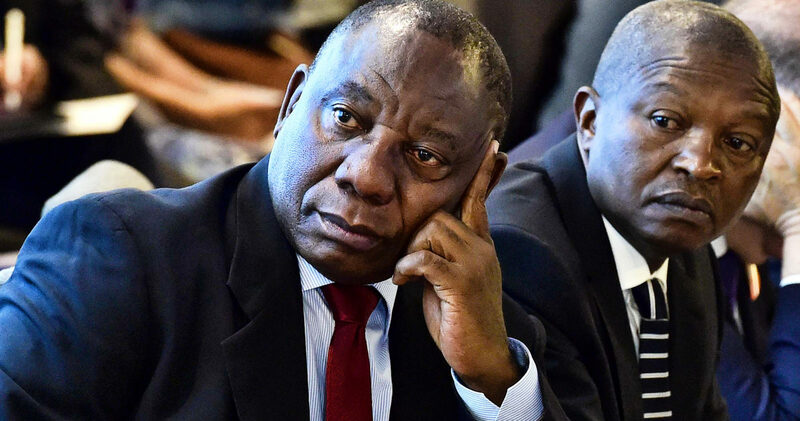 Co-leading in an interim structure would give the Zikalala faction less control of the public purse and deployments to the state would be split equally between the loose Ramaphosa and Zuma factions. In other provinces, there are bitter fights over who should take over, too. A usually mild-tempered province like Gauteng is facing some challenge with accusations of “politics of the stomach” taking over factional fights. Vicious factional fights are second nature to politics but what’s going on in the provincial ANC structures is a rapacity for control of state coffers. The bulk share of the vote won’t last forever and these provincial strongmen know this. There is a rush for control, almost as if people are saying to one another “eat while you still can”. The Ramaphosa win in the 2017 Nasrec conference may have halted the looting spree on a national level but the provincial budgets are still available, it seems. You would think the party would have learnt from its mistakes of 2016 this time around as it prepares for the 2019 provincial and national elections. But the ANC is notorious for correctly diagnosing its own problems but never seeing the need to remedy it.